Windows 7 Computer folder, by default displays your basic hard drives. But if you want to show all the drives, including the empty ones, like say a memory card reader, in your Explorer, you can do so as follows. Open Explorer > Folder & Search options > View > Advanced settings > Uncheck Hide empty drives in the Computer folder > Apply > OK. 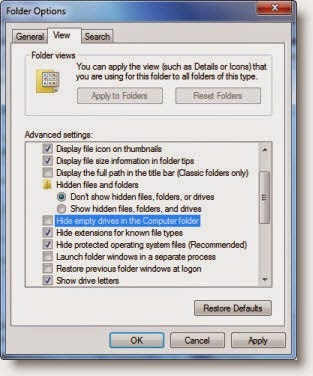 This option is there in Windows 8.1, where you can show all hidden drives too in the This PC folder.